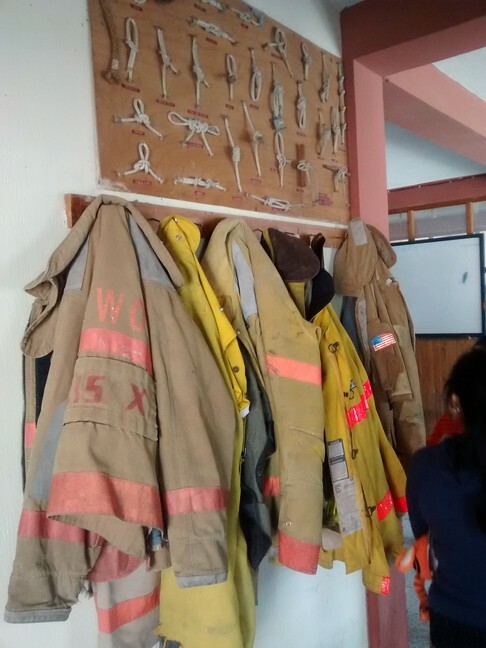 Like many small towns, Panajachel relies on volunteers to staff the fire department. Tag's class got an in-depth look at their firehouse. Students played soccer in the parking lot at the fire station while we were waiting for the tour to begin. As the kids were starting to tire from playing soccer the Fire Chief popped out and greeted us. It was time for the tour to begin. 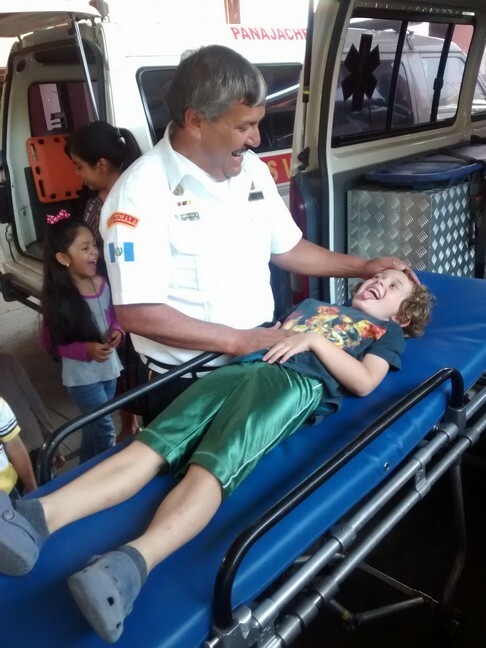 The Chief of the Panajachel Bomberos welcoming students from the LIFE School. Here are the highlights from the inside of the fire house. NOTE the US flag on the last jacket. Much of their gear is donated from other countries. The department has 8 firefighters trained in scuba diving which is important given that we're on the banks of Lake Atitlan. 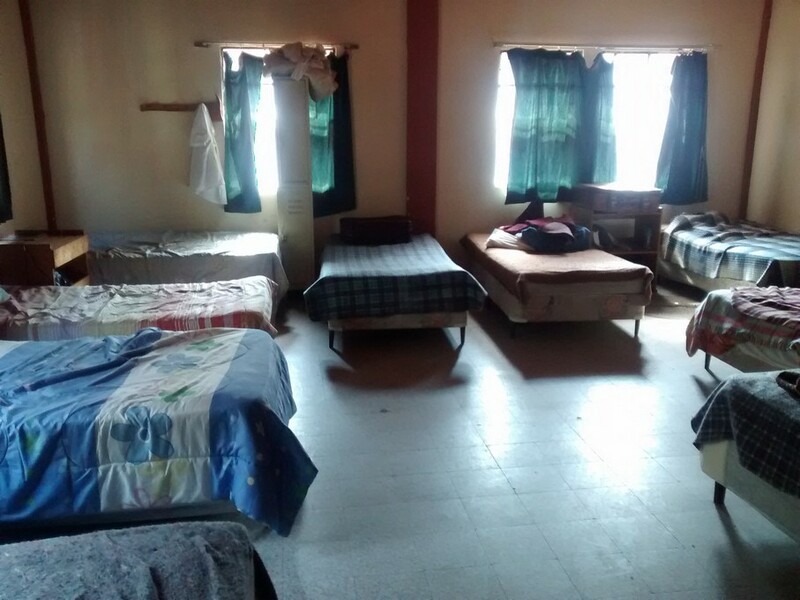 One of two rooms where the volunteers can sleep during a shift. The fire station's communication room. The Chief explained more about the fire house and taught the kids a song about the bomberos (all in Spanish of course). On to the fire pole! The chief showed the kids how to go down safely and they lined up eagerly. They loved it. Tag went down it twice (and I went down it once). Next up, more playtime at the fire house. Tag and his classmate are ready for action. Dogpile on the firetruck. Who needs a jungle gym? Just like the clothes, many of the vehicles in the back lot were donated by other countries. Most originally came from the US and Canada but some were clearly from overseas. There were three fire trucks, five ambulances, a boat and several miscellaneous emergency response vehicles. The tour ended with an overview of the ambulances. The chief pulled out a stretcher, picked up Tag and put him on it. He told us Tag had a tummy ache and needed to go to the hospital. I translated for Tag and he played along. Tag being tended to by the Panajachel Fire Chief. The grand finale was the ride to school. The Chief agreed to give us a lift in the ambulance. Two classes plus six adults piled into the ambulance. The ambuilance was packed but we had fun. Just before we got to school I jumped out of the ambulance to grab this video. As the ambulance rolled up to the school many of the teachers and students came out to see the ruckus. Apparently last year the kids came back on a fire truck. The class had a blast and learned a lot about the bomberos. I truly cherish the ability to go on these trips with the kids.